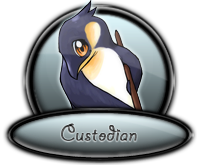 Custodians are the "Wiki-Bosses" of Elfpack. They're the masters of HTML, knowing all the codes, tricks and tips. They watch over member pages, making sure members don't post anything too naughty, and that vandals do not mess up pages, restoring those defiled pages. They also tend to all official pages, editing and tweaking them to make them nicer and easier. Anything wiki, they are the masters of it. If you have a problem or question related to the wiki of Elfpack, these notorious penguins are the ones to ask.
. . . Don't bug them too much though, the more time they spend on official matters, the less time they have to cyber with one another. Roaring [kittykittykitty]: The Leader and Organizer of the Custodians. She makes sure all the Custodians are doing their assigned duties, appoints new Custodians and retires those who are inactive or not working correctly. 2011-10-23 [Bookwyrm]: Contractors are contractors even if they don't currently make pages. So you qualify there. Hey Sammie -- as a rule of thumb, all Council Members have the Council page on watch, so if you want to alert us all to something you could just post once there and it'll work. 2013-04-10 [kittykittykitty]: Bewitching kitty huh? xD Traci was roaring for a long time as well... oh my... was this a custodians test? I think we failed in our duties. [sammie h! ], Magicians is a very different thing. Custodians are the janitors of EP: we clean up wiki messes and keep things tidy. 2013-05-05 [kittykittykitty]: Whatcha doin' Sammie?